Do you struggle to strike up a conversation in social situations? Does it make you anxious, fearful, awkward, and afraid you’ll make a bad impression? Or do you feel like you have trouble making friends because you feel you come off as insecure when you meet people? What if I told you i could make you a master of small talk to think faster on your feet, always know what to say and most importantly… NEVER run out of things to say? 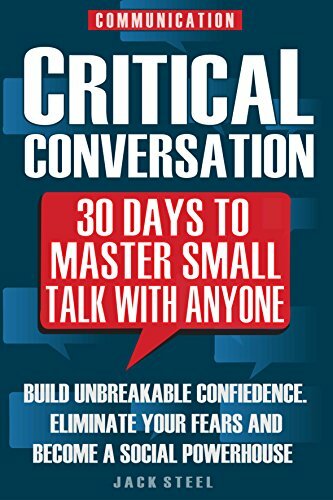 You will learn secret conversation Tactics that will teach you everything you need to confidently engage in effective small talk with anyone AND anywhere. In fact, you’ll get the in-depth guide to quickly see how powerful small talk really is… and how you can use it to build rapport in ANY situation. Mastering the art of small talk doesn’t have to be scary! The strategies in Critical Conversation have been tested and used with unbelievable success by a variety of people from all walks of life. I’ve broken them down into 30 simple to follow steps to see exactly how you can use their findings to your advantage. Best of all you don’t have to practice for years to become an expert in small talk. In fact, you can dramatically improve your confidence and speaking skills in just 30 days or less! All you have to do is follow the simple steps….that fits right into your normal day. Now, you’re just minutes away from becoming a MASTER of small talk! How to break the ice with absolutely anyone! Eliminate awkwardness and make others feel at ease around you! Build instant rapport and become a trusted friend… even if you’ve only chatted for a couple of minutes! Learn specific techniques for making small talk in formal situations, such as business meetings, job interviews and lunches! How to always shine at parties and other social events… even if you don’t know anyone at all when you show up! How you can make small talk automatic… so that you can strike up a conversation anywhere without any fear or worry ever again! Simple tips and tricks to never be afraid to strike up a conversation again! Just imagine never feeling forced and awkward… and wishing you’d just kept your mouth shut when you meet new people. To never be afraid you’ll make a bad impression again or come off as insecure in social situations. Finally have the confidence and poise to build powerful, positive relationships in any situation. There are no limits in your life, because deep inside yourself you know that you’re always in control of every situation and can always get what you want. Why spend another day dreading those “ice breaker” situations… when you can get your hands on the proven tips, tricks, and tools you need to confidently communicate with anyone?